The 2017 Chevrolet Silverado HD is shaping up to be quite the capable pickup. Along with the announcement of official power ratings, SAE-certified at 445 hp and 910 lb-ft of torque, it was revealed the new 6.6-liter L5P Duramax turbo-diesel V8 engine would be a smidge quicker, too. The 2017 Silverado HD will make its way from 0-60 mph in 7.1 seconds. That time is seven-tenths quicker than the outgoing Silverado HD 2500HD with 4WD. It may have something to do with those 910 units of twist arriving at 1,550 RPM, and sustains it through just 2,850 RPM. An advanced electronically controlled, variable-vane turbocharger also allows for greater exhaust temperature capability, enabling the engine to achieve higher power at lower cylinder pressure. And what better way to show off the newfound power than with a patriotic act? 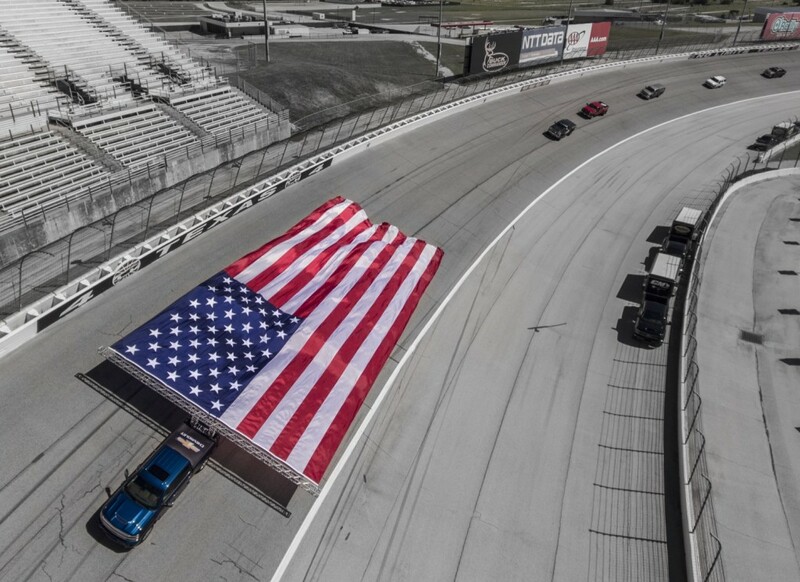 With all that low-end grunt the 2017 Silverado HD managed to pull off a Guinness World Record for World’s Largest Flag Pulled by a Moving Vehicle. Previous story How Much Nitrous Does It Take To Kill A Small Block V8? Good luck with this truck. After having two Duramax and nothing but trouble (one burned a quart of oil every 1,000 miles. And take a look at what you have on the exhaust systems on these new diesels and plan to get rid of it when you approach warranted end. With all the trouble I had GM ignored me. So, ………..I’m also done with them. I have my second Duramax, owned Dodge and Ford diesels before. Been in Hotshot business before, have lots of friends in the business still. I seen it all, drove all and know there pros and cons. So you are either a troll, or your Duramaxs have more then half a million miles and are old. Sorry man, I just don’t buy it, what a coincidence 2 Duramaxs in a row!! Ok, try this on for size. Blown head gaskets, in dealer from Nov. 7th to Jan 3rd because they could not get new bolts. Vibrating two piece drive shaft with design change the following year to one piece, $1,000 bill but they still charged me $300 even though is was totally design related. So called HD transmission, stuck in 4th gear pulling race car. Probably wiped cylinder walls driving home at 3000 rpm as oil consumption was quart every 1,000 miles. 2001, paid $38,000, sold it in two years for $22,000. Went to dealer and asked for supplier or employee discount, Had all my files and records and he told me they don’t care about the screwing I got and would do nothing. No wonder they went bankrupt. Friend had a 2002 version, blown head gaskets too with leaking injectors, cost him $10,000 as he was out of warranted. they may have all this fixed now but I do not like being a test engineer for them when I paid for everything. Heard similar comments on new ones being very good but you only put the screws to me once and I’m done with them. since that time i owned Ram’s with very good luck except for front end wear parts going bad often. My 2017 F250 is on order now. Injoy your “Beer Can” truck, Oh, watch out for falling toolboxes in your ” Reynolds wrap foil ” . Yup, according to retired GM truck engineering lead, Silverado will reduce weight in 2020 with the use of aluminum. chapter 11 put them behind and canceled their light truck diesel. I was at a DOE meeting with a GM engineer when that decision was made in March 2009. With body on fame this makes sense. If you get sucked in by those stupid adds please do not vote in the presidential election. I am well aware of early Duramax problems, that’s why I’ve never owned an LB7. Like I said must be an old truck. Now if you ever owed a 6.0 power stroke, that engine is complete disaster! Why would you own a PS with more recent problems then Duramax with old problems that had been long solved? I agree the 6.0L were blowing up on the way home from the dealers at about the same time my Duramax was spending about 50% of it’s time in the shop. What Chevy did to cure the Duramax was too late for my tastes. I would have given them a try though, had they acknowledged the 2001/2002 train wrecks they were putting out. Never did hear the root cause of the head gasket problems but suspect they are marginal on head bolts to get even clamping of the gasket, just a guess on my part. Anyway, they lost me as a customer, they don’t care and I don’t care either. The biggest issue with the first (LB7) duramax is the injectors, headgasket is not a common problem. Although early 6.7 PS has no relationship with previous Powerstrokes (beside the name) it does comes with its own share of issues, and pretty serious too, which is no better when duramax first came out. Yes new designs do come with bugs with every manufacturers, and it really matters who Handles your warranty and not the manufacturer. Boy I can’t believe all the problems you’ve all talked about with your Duramax’s, I’ve owned three and have never had one in the shop.. Well I take that back, I had one, the first one that used DEF in it and when I got about 300 miles on it, it said my DEF was low and needed to add, I called my dealer and asked him if they had forgotten to fill my truck with DEF, he said they always did.. Anyway I had tried to put a 2 1/2 gallon of DEF in it and it run over.. But the only problem was in something in the computer that was telling me the DEF tank was low.. other than that never had one back to the shop, except for oil changes etc. Why do they both offer gas engines in their 1/2 ton trucks that have more torque than their 3/4 and one ton gas motors??? I was hoping that an HD version of the silverado 6.2l would arrive in 2017 but instead they offer the 6.0L with only 380 on torque and that number does not appear until 4,200 rpm. Fords 6.2 L has 430 on torque but at a lower, 3,800 rpm but their 1/2 ton 3.5 turbo V6 is 460 on torque. Is this just a product life cycle issue or do they want to keep the big trucks just more simple? HD trucks are mainly used by businesses compared to half tons. They are detuned for reliability reasons. Many will be sold for 2 reasons: 1. Bragging about 910 lb.ft. 2. Hood scoop. It’s too bad that they did not get more torque out of the gas motor. All contractors in this area are going gas, less complicated and lower maintenance. Rumor had it that the were going to put out the generation 5 motor, 6.2L, with an iron block for reliability, maybe next year. I was at SEMA in 2007, they had a Suburban there with a prototype of the 4.5L Duramax. The comment was it would make about 300hp and 500-520lb.ft. When the BK hit, that ended that program even though quite a bit had been spent on development, that engine is mothballed, never going to happen. Too bad, it would have made an awesome choice for the big GM SUV’s. Sorry to hear you had bad luck with the first year LB7 Duramax in 2001. I also find it funny that while you hate GM products, you come onto a GM site about their new products to complain about a 15 year old issue. From what other LB7 owners told me, there was a head gasket re-design after the first 6 months of production and GM extended coverage to some. The LB7 injectors were also an issue for many. But to claim this new engine will have problems because you had issues is unfounded. GM should have stood behind your motor, it had a 100,000 warrentee and in many cases it was extended to cover specific issues. My current 2006 Chevy LLY/6spd manual 2500 HD just hit 250,000 miles. Only work on the motor was preventative maintenance like hoses and belt pulleys Well, the alternator did go at 228K. My 2007 LBZ Dually has about 205k, zero issues, but it’s alternator failed at 182k. Darn, nothing lasts. Even after getting let go from GM in 2009 I have purchased 2 new GM products since, and I am looking forward to ordering a new 2017 Duramax this spring. Time to trade in the 07 Dually, but they can take my 2006 ML-6 manual truck from me at my estate sale. Good luck and cheer up. Actually, I like the Silverado better than the f250 I have on order mainly because the front suspension bars allow a much lower ride height and the interior is very nice. But the 6.0 gas motor is only 380 on torque VS 430 for the Ford and the Ford torque peaks at 400RPM lower. I would like the diesel but previous experience has me gun shy and the complication on particulate filters, Catalytic reduction units, regeneration burns, urea injection (been know to freeze in Northern MI) and lots of sensors, expensive oil changes and fuel filters look like trouble to me. The 6.2L with selectshift feature will haul my 8,000# trailer just fine. My first new truck was a basic 94 Ford F150. While it was an OK truck, it had 3 sets of front brakes in the first 100k miles and by the time sold it at 133k tie rods and hydraulic clutch were shot. Switched the GM’s in 2000 and been very happy with all of them. First service on my 2006 was brakes…at 140k. Also owned an 02, 03 and 04 GM’s with 6.0/5 spds and liked them. Brother owned the 04 for 8 years after I bought my first Diesel, the 06. Nothing wrong with a gas engine if it meets your needs and gets the job done, but I really liked going from 15 mph highway to 22. Not sure how durable the new emission equipment is, but the guys at dieselpower.com (a Duramax/GM Diesel enthusiast web site) don’t trash them too badly. One thing to note is that the only tail pipe I have seen that was as clean as a urea-DEF truck was a hydrogen fuel cell vehicle. My friend, I believe the current version of the Duramax is very likely good. It’s undergone 15 years of development. But i’m not going to pay retail after what they put me through. It was not only the motor and excessive oil consumption, the transmission locked in 4th gear 700 miles from home pulling my race care trailer, probably not good running 3,000 rpm all the way home on a relatively new motor probably wiped the cylinder walls. Dilution of oil happened later. If they gave me minor price consideration I might have one on order. I actually had to call the UAW hall in Detriot to get me a contact high enough in GM to even give me a call and e-mail which the UAW did for me and it worked and I got a case number assigned. Remember, this truck was at the dealer for 7 weeks to get head gaskets done because they were out of bolts. Just imagine, and this was one incident out of 4 major issues. Don’t you think that is worth one vehicle at supplier or employee pricing??????? I agree the Duramax has seen significant improvement from the first version. And I also agree GM should have stood behind the truck. Running 3,000 rpm “shouldn’t” have harmed the motor, as they have oil squirters at the bottom of each cylinder to lube and cool the pistons and bores, plus the bores are hardened. We have seen 100,000 LB7’s with very visible cross hatch still on the bores. It’s too bad that an avoidable customer service issue aggravated mechanical problems. Most people, have had much better experiences most of the time with Duramax trucks. Having owned the same one for 10 years and then another used one for 2, I am very pleased and look forward to another new one. For what it’s worth, almost all of the technicians on the Ford side have told me to go with the gas motor if pulling less and 8,000# which is the case for me. It sounds like the Duramax is solid on reliability, now, so I guess we’ll just have to wait for the comparison tests to come out. Just found out yesterday that Ram is discounting the Long Horn version of the Cummings by 20% so they are already feeling the Improvements on the Silverado and Ford HD’s. You can get a pretty nice one for $50,000 but they are a heavy and a dated design. Got coils on back unless you go 1 ton which got leafs and ride a lot better than the past two Rams I had.